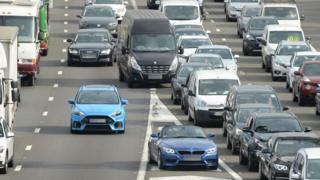 Meanwhile, drivers in Liverpool face the second worst traffic jams, the National Infrastructure Commission (NIC) said. The analysis compared the ease of driving from one part of a city to another at peak and off-peak times. The NIC called for more powers to be devolved to elected mayors to solve congestion. Greater Manchester Mayor Andy Burnham supported the call, tweeting that he was asking the region's transport body to "to do all it can to minimise road chaos and government to sort out trains". "But bottom line: GM needs new transport powers," he added. A combined area spanning Accrington and Rossendale in Lancashire was the highest-ranked non-"primary urban area" on the list at 26. NIC chairman Sir John Armitt said the fact cities occupy the first 25 spots demonstrated the need for major new investment on urban transport networks. "Our metro mayors and city leaders need to be in the driving seat to develop local solutions," he added. "We've called for powers and increased funding to be devolved from Whitehall to local leaders. "This will give the people who know their cities best the tools they need to improve urban transport and support the delivery of new employment opportunities and homes." The NIC is an independent body established to advise the government on the UK's infrastructure needs. It produced the traffic study as part of its National Infrastructure Assessment, which calls for the government to allocate an extra £43bn of funding for improvements to urban transport until 2040. AA president Edmund King backed the NIC's call for improvements to public transport, adding "traffic jams will remain a fixture of city life" while drivers feel they have no alternative.